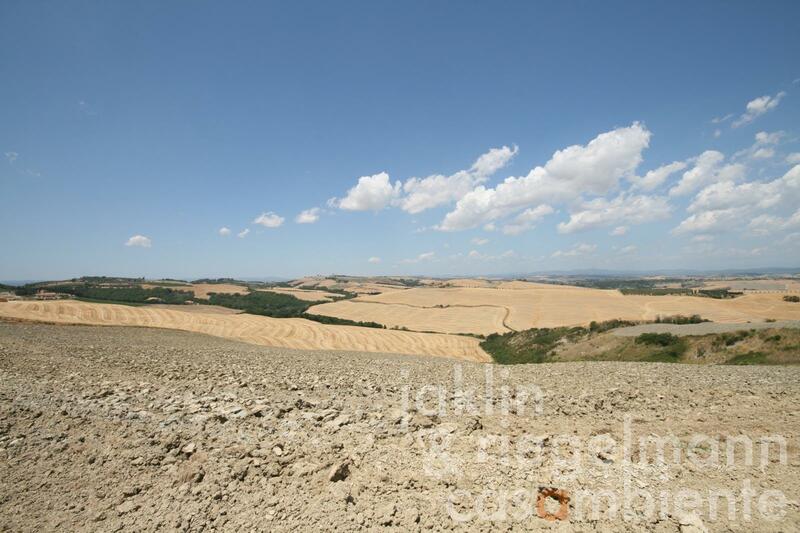 In a fantastic panoramic position with gorgeous views over the landscape of the Crete Senesi towards Siena and Montalcino, this agricultural estate is for sale. On approx. 300 hectares of land - of which approx. 200 hectares are arable land - 4 farms with a total of approx. 4,000 m² of building space are spread out. Each farm has its own characteristic structure and unique position. All buildings have to be restored from the scratch. For the existing buildings, stables and barns, renovations are possible both for private use (2,897 m²) and - by means of an agricultural improvement plan - for agriturismo residences (1,023 m²). The remaining 276 m² remain agricultural outbuildings. Italy, region Tuscany, province Siena. Electricity, mains water, own well water, own spring water, fireplace, private parking, olive grove.